Judy is a member of the famous Scheer family, producers of numerous lumberjack competitions. 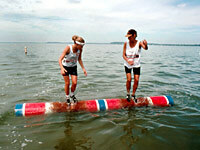 Judy began logrolling in 1968 and is a seven time world champion. In her entertaining and educational programs, Judy tells the history of logrolling as a sport by using storytelling, old photographs, tools and video. She focuses on how logrolling evolved from an occupational practice (log driving) to its current form as a competitive sport. Electricity and VCR/TV for the video, if available. Best to contact by email.